We create and do all of our custom jewelry designs in-house and that allows you as the customer to have a unique jewelry design experience. All of our pieces are proudly handmade here in Colorado Springs, Colorado. Custom design does not just entail the fact that we design our own pieces for our shop, but we can create custom jewelry designs unique to you as well. We take pride in the ability to make you something that is custom to your desired shape, size, color, and style. You can inspire the entire custom piece, or we can help you along the way. Wondering what we can design specifically for you? Do you have a specific idea, inspiration, or dream for a custom jewelry design? Do you love owning things that no one else in the world has or can get? Let us help you create and design your own engagement ring and wedding band set to show your love for each other. 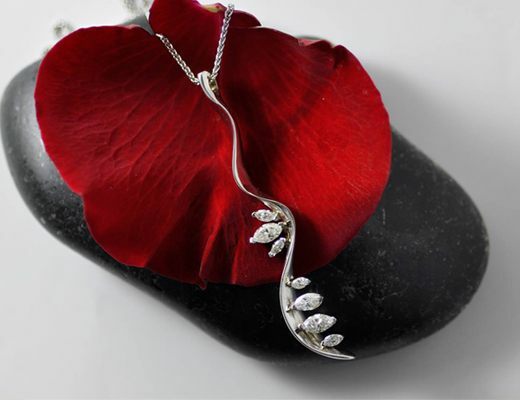 We can also help you design a beautiful pendant for an anniversary or special event in life. Having handmade jewelry can increase the value and significance of a piece, as you know you were the one who inspired and gave the piece life! Do you have jewelry that you do not wear anymore? Bring that jewelry in and let us redesign it into something you will want to wear every day. We can use your family diamonds and gemstones as well and create jewelry that will become a new heirloom for many years to come. You can take an ordinary piece of old jewelry and we can transform it into a custom jewelry design that no one else has! We can do as much or as little of the customization as you prefer, and your ideas and vision are what we will re-create! Gain ideas by browsing through our gallery of other pieces on our site or stop by our shop in downtown, Colorado Springs to gain the inspiration you need to make a piece of handmade jewelry, from Jack Miller Jewelry Designers your very own! Here at Jack Miller Jewelry Designers we craft engagement rings that will fully express your love and last a lifetime. 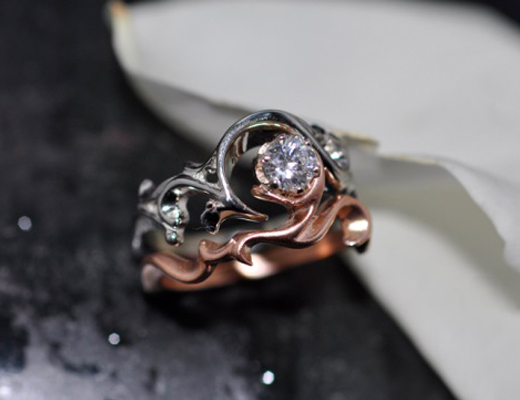 Our passion in life is to help you create a ring that tells your true love exactly how you feel without saying a word. Jack has been creating beautiful jewelry in Colorado Springs for 40 years, so you can be sure you will receive a ring that has been crafted to be both durable and beautiful. Call us to make an appointment to speak with Jack or one of our in house designers about making the perfect ring for your one true love. Pendants offer a delicate look, but when paired up with gold chains they are simply stunning. Wear them with a halter-dress to give them even more of a dazzling appearance. The base metal colors combined with complimentary precious stones will form a unique pendant that you can take pride in giving to the wearer as a treasured gift. Are there pieces of fine jewelry in your jewelry box that don’t get much use anymore? You may have a valuable heirloom with an old style that just doesn’t fit with your current look. The good news is there are plenty of ways to update older jewelry with a jewelry redesign at Jack Miller Jewelry Designers. When it comes to achieving the perfect custom design, we pride ourselves in our capacity for unique works of distinctive quality. If any of our clients hope to transform a piece of jewelry with an outdated fashion into something a bit more exciting, our team of fully-qualified jewelers are dedicated to making their desires a reality. You can expect your piece to be crafted by fully-accredited goldsmiths with the skill and experience to make your dream a reality in 18K or 14K gold or platinum – or the metal of your choice.